Winter citrus is an anomaly to me: bright and flavorful fruits that are at their peak when everything else is dormant. I can’t seem to get enough grapefruit, Meyer lemons, clementines, oranges, and especially blood oranges! 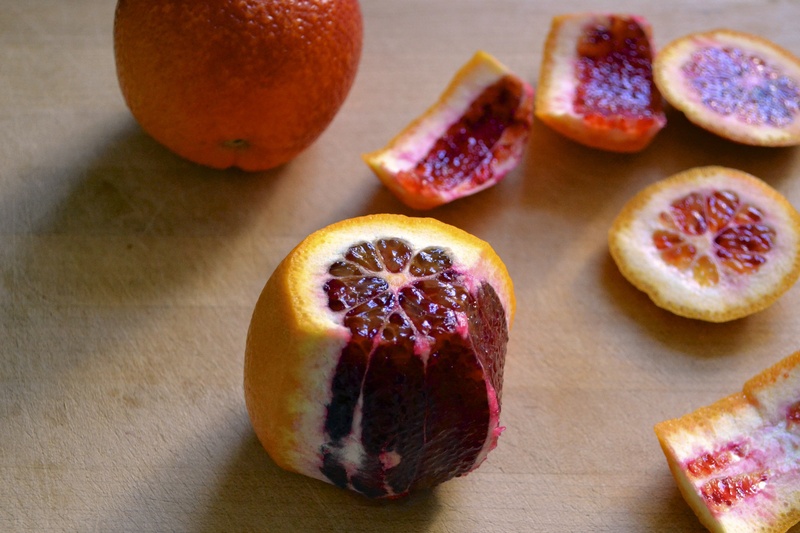 Have you had a blood orange? Eating them is like a secret escape to my own tropical island. Where’s my mai tai? Where’s my pool? Where’s my hammock???? The salad I made is adapted from Alice Water’s amazing avocado and grapefruit salad from her-must have cookbook The Art of Simple Food. A girlfriend of mine had this cookbook and I poured over it every time I was at her house. And then I received a copy for my birthday!!! The recipes are so simple and so flavorful. 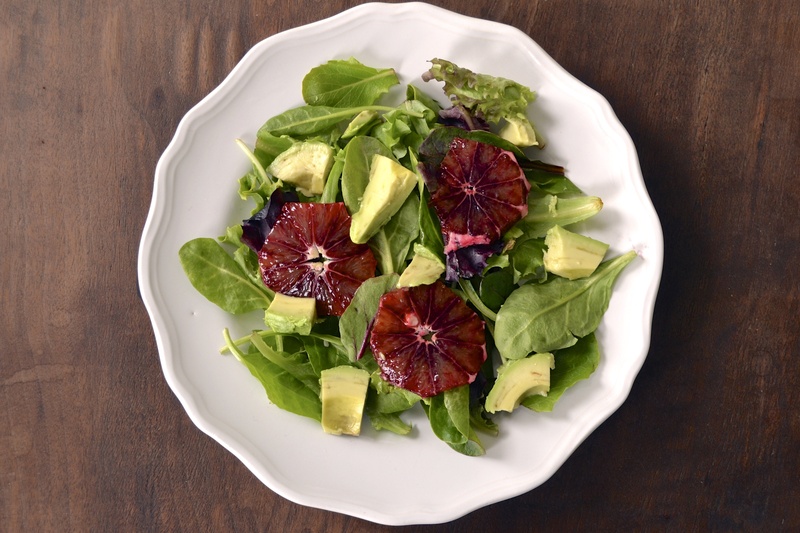 I swapped blood oranges in for the grapefruit and served it over a bed of mixed greens. Using blood oranges makes me feel like I just bedazzled my salad. I whipped this up for a quick lunch and took it to work, eating with some leftover salmon. It totally made feel like I was on vacation in the tropics and not sitting inside an office cage in the middle of winter peering out a tiny jail-sized window. Womp womp. Hrmmm….note to self…get a hammock for my office….and more winter citrus! Divide the salad greens evenly among four plates. With a sharp knife, peel the rind from the blood oranges down to the flesh. Slice in thin rounds. Divide the orange slices evenly among four plates. Cut the avocados in half and remove the pits. Sprinkle the inside lightly with salt. Inside the skin, slice the avocados in 1/4-inch slices. Carefully scoop from skin and divide the avocado slices evenly among the four plates. In a small lidded jar, add vinegar and olive oil with a pinch of salt and pepper. Shake well. Drizzle the vinaigrette lightly over each salad. Store leftover vinaigrette in the refrigerator for up to 3 days. What a beautiful, simple salad! I especially like the colors. Thanks. Me too! It’s the perfect mood-boosting salad on a dreary and mopey day! This is a bedazzled salad indeed! Delicious.